← Bougainville Referendum News Update : #PNG PM O’Neill and President of Bougainville Momis agree at JSB on referendum question “Do you agree for Bougainville to have, option 1.Greater Autonomy or option 2 .Independence. 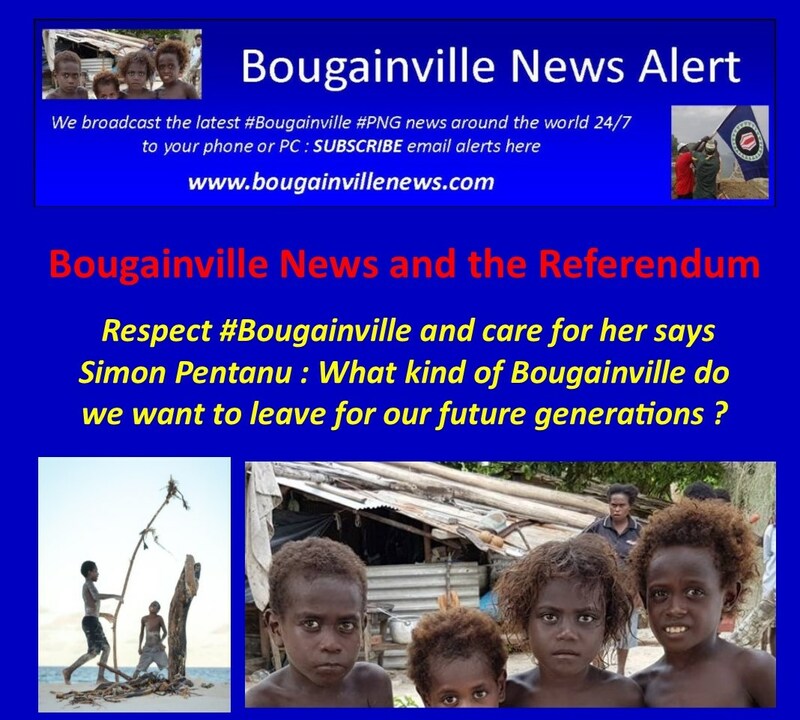 Bougainville News and the Referendum : Respect #Bougainville and care for her says Simon Pentanu : What kind of Bougainville do we want to leave for our future generations ? “ In Bougainville we should learn to start listening to each other, especially to the voices in the wilderness. The echo to a sound doesn’t always come from where you think it will. Everyone’s voice is important and must be heard. We should heed our backbench voices – not only when they raise their voices, thump the bench and walk out. Autonomy and unity must be about the caring spirit of individuals having a collective cause to promote a better humanity. We must see the Referendum as not just an inevitable political contest. You are not going to choose between two individual competing candidates. What you will be deciding on is what kind of a society you want – what kind of community we all want. The sea is a huge food bowl – a supermarket for all varieties of seafood. Its waters serve as highways for transportation. It provides therapeutic bathing and gives us salt for seasoning and preserving food. It is the hugest swimming pool! It provides a facility and venue for all manner of leisurely and competitive sports. The beauty and serenity of its white sand beaches – where millions of tourists and locals flock to walk, laze, tan and burn themselves – give joy to people across the world. The sea drives the fashion industry, which keeps churning out new designs to gird the loins of bathers, swimmers, surfers, sailors and beachcombers. The list of things associated with the use of the ocean goes on and on – in fact it goes miles out to sea. This isn’t surprising when we consider about 71 per cent of the Earth’s surface is water covered and the oceans hold about 96 per cent of Earth’s water. Water sports are among humanity’s most popular pastimes and activities. We seem to be unable to get enough of game fishing, snorkelling, diving, water skiing, kiteboarding, sailing and more. And then there is surfing. Surfing has developed its own international culture, which connects a huge population of world surfers through a common language of love, fun, serious competition and an obsession for surfing and its variations across continents. Surfers flock to places like Fiji, Tahiti and Bali, to catch the famous waves in these destinations. Humans’ connection with the sea obviously has a huge impact on many small state economies. Some of the most popular resorts around the world are dotted along the coastlines of small nations – in the Pacific, the Caribbean and south-east Asia. Eco-tourism has emerged in many places as a conscious option for travellers who want to experience the beauty of the planet without damaging our fragile environment in the process. Sadly, the advances being made by eco-tourism in Pacific countries are probably being cancelled out by the continuation of practices from last century that are damaging our Earth. I’m talking about multinational logging companies clear felling huge tracts of rainforest (including virgin rainforest) in places like PNG and the Solomon Islands. Rainforests, sometimes called the lungs of the Earth, are also being short-sightedly destroyed to make way for oil palm plantations, which, although they appear green, are actually lifeless monocultures that are sprayed with chemicals and leave the soil depleted. Right on the edge of the growing township of Buka, Bougainville’s current HQ, the senseless uprooting of tracts of healthy mangrove trees has not been stopped by authorities, even though it goes on in broad daylight. Mangroves are an amazing gift to humanity. They are nurseries for numerous fish and sea creatures – a place for marine life to breed, feed and raise their young away from the threats of sharks and bigger ocean fish. And we are finding out how effective mangroves can be in protecting human populations from tsunamis and tidal surges. To rip them out is madness and an action we will regret. We must preserve the things that give our communities life – the oceans, the forests, the rivers, the mangroves and the mountains. Interestingly, these things, which sustain our lives, are also attractive to eco-tourists. In many respects PNG is fortunate to have avoided the ravages of mass tourism. Whether unwittingly or otherwise, tourism in the country has developed into a niche market of mostly adventure-seeking travellers, more interested in reefs, rainforests and unique cultures than in nightclubs and international hotels. For this we should be eternally grateful. When it comes to tourism in general and in eco-tourism in particular, the Autonomous Region of Bougainville can, very clearly, learn a lot from the rest of PNG, from our cousins across the border in the Solomon Islands, from the rest of the Pacific and from countries and peoples in the rest of the world. Before the advent of industrial logging, the Solomons was a country of hundreds of forested islands which provided for the needs of its people. I can recall conversations that the startling Marovo Lagoon, which surrounds Vangunu Island in the Solomon Islands’ Western Province, was being considered for UNESCO world heritage status. The lagoon had the largest double barrier reef in the world and it was being considered for listed as one of the world’s natural heritage wonders. Sadly, 15 years of open slather logging – along with the inevitable run-off and reef damage – put an end to that dream. The little money that was earned by the indigenous land owners will be long gone. The trees will be gone. The lagoon, once a place of precious local and national pride, will never be the same. 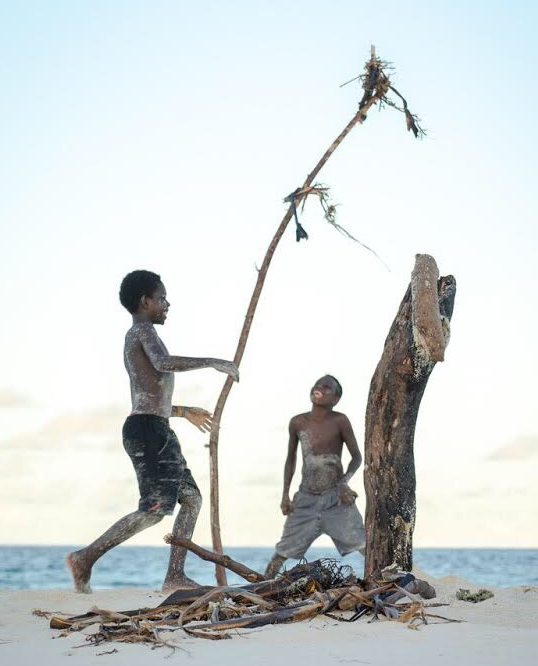 The country and the many generation of Solomon Islanders to come will be the poorer for the lack of foresight and policies of their successive governments and the wanton greed of their elders who gave this land to the loggers. Similar examples of this abound in PNG, where huge tracts of forests are being clear felled under the guise of controversial Special Agricultural Business Leases (SABL). Logging Tonolei in South Bougainville, under a SABL type agreement with landowners, to introduce oil palm that will destroy good fertile land is very short-sighted. It is the sort of plan grasped by political leaders who want quick fixes and quick returns. We must resist this sort of thinking. In the long term the landowners will be worse off after depleting what is their capital, their resource. This forest has sustained their populations over hundreds, perhaps thousands of years. The damage to the land, the pride and integrity of a self-sustaining people and the loss of their ecosystem is irreversible. Can we please learn from the example of the Marovo Lagoon? It is not dissimilar to a person losing their soul. The knee jerk reaction to this has always been that this is development and progress. The truth is we have a growing population of people who have become victims of this so-called development and progress. Yes, we want development and progress, but let’s have it on our own terms and not destroy the things that give our communities life. Let us back ourselves that we will not go under if we do not knock over the trees, dig up and maul the earth and scavenge the seabed to supposedly ‘catch up’ with the rest of the world. The truth is those who take from the Earth are never satisfied, while we are quite content to live by what nature provides and will keep providing, so long as we respect her and take care of her. This may sound overly simplistic, but if we are prepared to learn from each other, we can make the world a safer, more peaceful and contented place without greed, wars and prejudice. In Bougainville we should learn to start listening to each other, especially to the voices in the wilderness. The echo to a sound doesn’t always come from where you think it will. Everyone’s voice is important and must be heard. We should heed our backbench voices – not only when they raise their voices, thump the bench and walk out. Autonomy and unity must be about the caring spirit of individuals having a collective cause to promote a better humanity. And what kind of Bougainville do we want to leave for our future generations.